Besides its rich and romantic history, what distinguishes the "Panama" from other straw hats is its tight weave. The best of Panama hats are woven so finely that until you examine one closely, you can’t see the weave, and even when you can, it is so perfect that to the uneducated eye, it seems machine-made. The hat’s thinness belies its strength and durability. Pour water into a high-quality Panama hat, and the water will stay put. To make a Panama hat, one must first make the straw that comes from the toquilla plant, a perennial herb that looks like a palm but isn’t. During the rule of King Charles IV of Spain, the species was renamed the Carludovica palmate in his honor, but only botanists call it that. The toquilla is a trunk-less species that grows in the hot, humid lowlands of coastal Ecuador. The provinces of Guayas and Manabi where toquilla plantations are plentiful are north of the port city of Guayaquil, a stop many visitors make for their flight from mainland Ecuador to start their Galapagos Islands cruises. Hats are not the only products woven from toquilla. The straw is also made into strong mats, baskets, purses and other items. 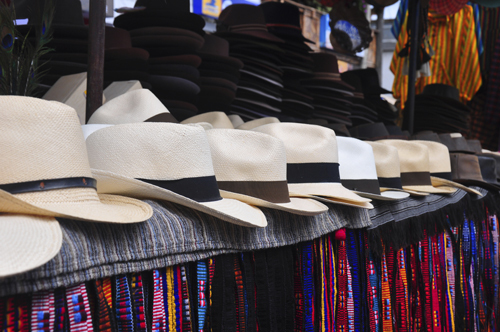 These too make unique, toquilla souvenirs, though nothing says travel to Ecuador so stylishly as a Panama hat. Toquilla leaves grow from the ground and split at the top into two halves. The leaves are cut when the stock is about three to four feet long. The young toquilla are harvested year-round by cutters called pajeros, timed when conditions of lower humidity allow the stocks to be cut more easily with a machete. After leaving the fields, the stocks are cut into narrow strips, and then boiled, turning the fibers limp and darker than their original color. After washing the strands, they are allowed to dry in the wind, a process that causes them to role horizontally. Once dry, the strands are divided according to color, size and quality which will ultimately determine the hat’s price. Bundled, the fibers are ready to be distributed to their next buyers who will put them in the hands of the craftsmen who begin the process of turning the straw into hats. The hat’s Ecuador tours are not over. It is the beginning of a very long journey that will take the fibers to the Andes and perhaps end in Paris. Everyone knows what a Panama hat looks like but not so the Ecuadorian straw hat, though they are one in the same. Master craftsmen had been making these lightweight, durable straw hats centuries before Panama was, in fact, Panama instead of a part of Colombia. Likewise, ancient cultures that inhabited the coastal region of modern day Ecuador were making headgear from the same straw long before the country of Ecuador was born. The hat is named, not for where it is made but for where it first became popular. People who saw them worn in Panama assumed the hat was made there. The modern-day Panama hat originated in the first quarter of the 17th century. Sales of the materials for the hat transformed the economy, offering many coastal residents employment at a task for which demand was international and growing. By the 1800s, indigenous craftsmanship melded with colonial manufacturing know-how to construct the hats at a faster rate. The first Panama hat factory to be established in the Andes was in the colonial city of Cuenca in the Andean province of Azuay in 1836. Labor and materials were imported from the coast where as was the custom, villagers, starting as children, learned the Panama hat trade. Railway travel between the coast and the Andes helped turn Panama hats into a national industry. Lightweight and protective against the penetrating sun of the tropics, the Ecuadorian straw hat was ideally suited to the country for which it was named. US workers wore them while building the Panama Canal. Prospectors who passed through Panama on their way to join the Gold Rush picked up a hat for the days they would be spending bent over streams in the California sun. One large buyer was the U. S. government, purchased to outfit its troops for the hot-weather fighting conditions of the 1898 Spanish American War. As the 20th century progressed, the Panama hat continued to grow in popularity and became a growing source of revenue, a Godsend when the country’s other major source of income, cacao, was wiped out by fungal disease. The monopoly didn’t last. Eventually other countries got into the Panama hat game. Ecuador began exporting the straw to the neighboring countries of Colombia and Peru as well as farther afield. Since then, other countries have legitimately been able to claim the hat as their own. Most use straw though a popular paper version of the hat, called the Shantung, is made in China. It isn’t as durable as an Ecuador Panama Hat but it is attractive nonetheless. Throughout the world, wherever the hat is manufactured, people admire it, saying, “What a beautiful Panama hat.” Visitors who travel to Ecuador who wish to purchase a Panama hat in its country of origin will have many opportunities to do so. Southern Explorations offers many Ecuador tours from which to choose. For additional information about our Ecuador tours including travel to the Amazon and Galapagos Islands tours, both land-based and cruises, please read our trip descriptions.